Our ROM has built-in microG free-as-in-freedom re-implementation of Google's proprietary Android user space apps and libraries. This enables you to use every Google service you need without keeping another closed-source binary blob in your Android system. LineageOS for microG comes with F-Droid already installed. You can use it to access plenty of FOSS applications or even a Play Store bridge repository like Playmaker or GPlayWeb. We ship OTA updates from upstream LineageOS weekly. In this way you always receive new features and security updates just few days after they are released mainline. This ROM has few changes from the official LineageOS ROM, so you can follow the installation guide for your device on the LineageOS wiki. Our ROM and LineageOS use different signing keys, so you can't flash our ROM on top of the official LineageOS; however, the procedure needed to migrate from the official LineageOS is very simple. If you don't care about losing your current data just reboot into recovery, wipe System, Data, Cache and Dalvik and, without rebooting, install LineageOS for microG. you have to uninstall them before the ROM migration. You also have to uninstall the GApps if you have previously installed them. Finally download the migration ZIP and a build of LineageOS for microG (make sure the ZIP you're installing is newer than the current installed ROM, if it is not, wait for the next build), reboot in recovery, install the migration ZIP and, without rebooting, install LineageOS for microG. To upgrade from LineageOS for microG 15.1 to LineageOS for microG 16.0 it is not necessary to wipe your data, just upgrade your TWRP bootloader and flash manually the latest LineageOS for microG 16.0 zip. 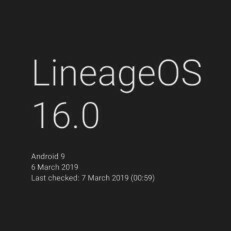 To upgrade from LineageOS 15.1 to LineageOS for microG 16.0, first upgrade your TWRP bootloader, then upgrade to LineageOS 16.0 and finally follow the Migration from LineageOS instructions. To upgrade from an unofficial LineageOS build to LineageOS for microG 16.0, a factory reset is required, otherwise you can create your own migration zip, and follow the Migration from LineageOS instructions. First, open the "microG Settings" app and check if everything is OK in the "Self-Check" section; you will probably have to give microG some permissions, like location and file access. The UnifiedNlp section will have some issues: that's normal, we haven't configured it yet. UnifiedNlp is the microG Network Location Provider, which provides the current location of the device without the use of the GPS. While Google's NLP can only use Google's servers for positioning, UnifiedNlp obtains the geolocation through different plugins, which interface to different services. If you want to use these plugins, go to microG Settings -> UnifiedNlp Settings, configure and enable both. If you instead want different plugins (like the LocalGsmNlpBackend, which uses a local offline database of the GSM towers to obtain the location) you can download them in F-Droid and enable them in the same way. Reboot and check whether UnifiedNlp is correctly set up in the "Self-Check" section of the "microG Settings" app. 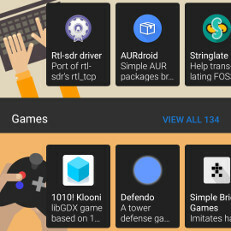 You have the F-Droid Privileged Extension installed by default, why not use it? To make a good use of it go to the F-Droid Settings and enable auto updates. Many apps rely on the Google Cloud Messaging, a Google proprietary system to push notifications to your device. This feature is implemented in microG but, as not every user requires it, is disabled by default. 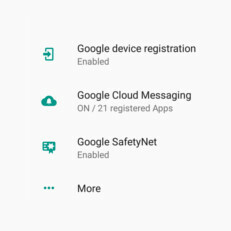 If you need it, enable the "Google Device registration" and the "Google Cloud Messaging" features in the "microG Settings" app. If you want the weather features of LineageOS (like in the lock screen or in the cLock widget) you have to download a weather provider from here. Choose your favorite one, install it and configure it in cLock (or in Settings → Apps → Gear icon → Weather). Our ROM doesn't include root by default for security reasons, but you can easily install it: go here, download the appropriate ZIP and install it from the recovery. Why all of this? Isn't OpenGApps free software? Yes and no, the name "OpenGApps" is misleading. While OpenGApps uses free software to retrieve and bundle the GApps, the apps themselves are not free software, they are in fact the same Google Apps you find on a new phone. Why should I use microG instead of the standard Google Play Services? First of all, freedom. I can't explain here why free software is so important (this is a FAQ, not a 200 pages manual), but if you're interested you can start by reading this. Second, the Play Services are very expensive in terms of resources, they drain lots of battery and they use lots of space, while microG requires much less resources. To give you an idea, the smallest possible package of OpenGApps ("Pico Package") on ARM 7.1 is ~125 MB, while the full microG suite (GmsCore, GsfProxy, FakeStore, MozillaNlpBackend and NominatimNlpBackend) is ~4 MB. Isn't Android free software? Can't I just install LineageOS without both GApps and microG? With microG these services (and many others) are reimplemented. Is LineageOS for microG completely free software? Unfortunately no, like LineageOS it still has some non-free components. See the Replicant project for more informations. Which is the current status of microG? Which APIs are already implemented? Why do we need a custom build of LineageOS to have microG? Can't I install microG on the official LineageOS? MicroG requires a patch called "signature spoofing", which allows the microG's apps to spoof themselves as Google Apps. LineageOS' developers refused (multiple times) to include the patch, forcing us to fork their project. Wait, on their FAQ page I see that they don't want to include the patch for security reasons. Is this ROM unsafe? No. LineageOS' developers decided not to include this patch for various reasons. The signature spoofing could be an unsafe feature only if the user blindly gives any permission to any app, as this permission can't be obtained automatically by the apps. Moreover, to further strengthen the security of our ROM, we modified the signature spoofing permission so that only system privileged apps can obtain it, and no security threat is posed to our users. Do you use test keys? Heck, no! We sign all our builds with our own private keys. Do you offer OTA updates? Do you offer delta updates? Not currently, but it can be done if there's real demand. Can I install apps from the Play Store on this ROM? F-Droid is included in our ROM, so you can freely download all the FOSS apps on their repositories. However, if you need apps which are available only on the Play Store, you're free to host your personal instance of PlayMaker or GPlayWeb and connect it to your F-Droid client, which will let you download apps from the Play Store and install them via F-Droid. Another solution is to use a local app, like Yalp Store. Do I have to enable "Unknown sources" to install apps in F-Droid? Our ROM includes "F-Droid Privileged Extension", which allows F-Droid to install and update apps without the need of user interaction or the unsafe "Unknown sources" option. We already build LineageOS for microG for every device supported by LineageOS. Find your device in our Downloads page! I don't trust your build, I want to build it myself! No problem! Our builds are done with this Docker image, feel free to build it yourself. I am running a custom build of LineageOS, but yours is way cooler! How can I migrate to it without losing my data? Replace the LineageOS official keys in our migration ZIP with your keys (or follow the suggestions in the LineageOS migration guide). Where do I report a bug?